This past late Fall and early Winter I had the special treat to create two dresses for sisters. Like so many of my custom creations it was so wonderful to see how the creative process (and final creations!) turned out in two very unique ways. Like the sisters, the dresses are equally beautiful and elegant, but very different in feel. The first dress was for Miss C. Within minutes of entering the studio for her Custom Consult she had found a scrap of black/gold trim from another creation. From there I brought out the fabrics we ended up using which happen to be some of my favorites from my collection. The design process was then pretty straightforward. She knew she did not want any scratchy material on where she would feel it, so we paired the metallic netting and lace with a soft, silky satin bodice. Here are some photos of Miss C and her mom at the Reveal Session of her dress, that anticipation and excitement is such an amazing part of this process. Not to mention the tenderness between parent and child that I get to witness! And here she is in the final creation. What a beauty! A few weeks later her older sister Miss P came for her custom Consult. Miss P was much quieter and more methodical in her choices. She was gravitating to soft ivory and ballet pinks. We had a great time pulling out a bunch of fabrics and had fun playing around with layering different colors of sheer fabrics together. This is one of my fabric design tricks, and we found a surprise color blend that brought out just the right shimmer in an iridescent snowflake patterned netting by underlaying it with a peach mesh. While the bodice construction of the two dresses is identical, sometimes different fabrics dictate different silhouettes. So for Miss P's dress we went with a circle skirt construction that give a slim line through the waist but flares out for maximum twirl. Very sophisticated. Miss P's Reveal Session was one of my favorites. I mean look at that grin! And the dress just floats on her, so so soft and lovely! I always love to hear the end story of how the dresses are worn and the special experiences that are had in them. The girls got to wear their dresses to the Magic of Christmas event which they attended with grandparents who were visiting internationally, a magic night all around. And a special treat for me, the girls wore the dresses for a wonderful photoshoot with my friend Emilie of Emilie Inc that ended up on the family Holiday Card, so fun! Seven year olds are awesome, I have a newly minted one of my own, so I can say this with good authority. Still small enough to be tender and willing to grab your hand walking through a store, but old enough and smart enough to have their own fierce and wonderful passions. Miss P knows for sure what she likes, and when she likes something she likes it ever so much! Fairies are one of her favorite things and growing up in Maine she has been lucky enough to spend a good number of days at the Fairy Friday program at the Coastal Maine Botanical Gardens steeping herself in fairy magic. She is also a thoughtful child who is willing to spend a lot of time in working through her ideas. She arrived at my studio for her custom consultation with a terrific sketch of what she had been envisioning for her Fairy gown. We were able to talk in great detail about what she liked most about her sketch and what qualities we were looking for. Then she went to town exploring the deepest depths of my magic closet of fabric. We had every color, texture and kind of fabric out for draping and collaging into a mental idea of a dress. Sometimes it can be hard to narrow things down with so many choices but we ultimately came up with a list of things she liked best: blue, pink, brocade fabric, butterflies, polka dots, and glitter, glitter, lots of glitter! The silhouette was an evolution of my standard Princess Dress, Miss P was more interested in length than a big fluffy twirly skirt. I love the layering and mixing of the soft blue and pale pink in this dress, each color gets it's own focus and the blending together brings out a very tender feeling to this dress. The Reveal Session was particularly poignant to me. Miss P was very quiet, but with big luminous eyes. She really just wanted to be close with her mama and there were some really great hugs. I've since seen her in her dress full of laughter and enthusiasm, but there was something very touching about her quiet radiance in taking in what she had envisioned brought to life for the first time. 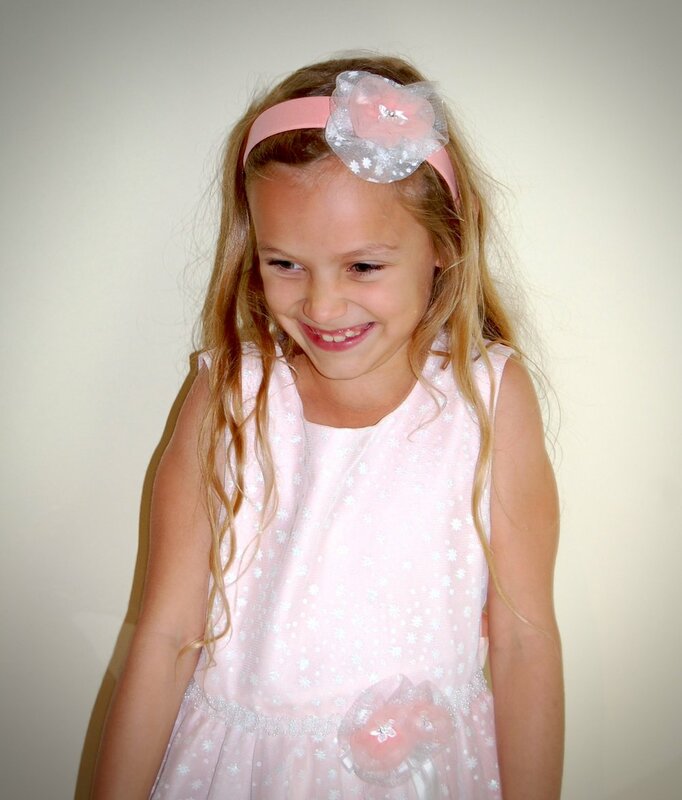 Creating a custom dress for a child is always an honor. Each child is so very different and their personalities make the experiences completely unique from one to the next. Miss C is one of four siblings, so her mama and I planned that her planning session would be Miss C, her mom and me so that she could have some special alone time with us in the studio, which she used to full advantage! For her reveal session Miss C brought along her two sisters along with her mom. Their energy was totally infectious, everyone was super excited for the birthday girl. It was really fun to see how these sisters' energies flow together, they are each so distinct, but form such a tightly bonded little trio. Her sisters jumped in for some photos and then for extra fun modeled some samples from my studio for a few shots. So much fun! There are many things that I love about what I do. One of them is the moment when working on a new creation that I find the just right mix of materials and the vision clicks into my head for the perfect dress. But this is an old love of mine, from childhood days of sketching gowns and dressing up dolls in my hand-made creations. A new love of mine is getting time to watch and interact with kids during my photo shoots. All the best pictures of my work are done by my sister-in-law, Kate Eden Renyi, who is an amazing professional photographer specializing in photos of kids and families (you check out her work here!). But often, my product photos are done here in my studio, I have a corner devoted to photos with various backdrops, lights and props. I work with the children of my friends, real kids, who are not models but are fun and have great spirits that I know will shine through in photographs. I try to keep the mood fun and playful with music they can dance too and, if need be, the promise of balloons and treats after we’re done! I know standing in front of all those big lights and having a camera clicking in their faces can be intimidating so I show them everything I’m doing and how it all works, then we start playing around to see how to get them comfortable to open up, relax and smile. It’s captivated me over the last few months how each child is so different in what sparks them in order to be able to move past shyness and show their special sparkle. Some kids come alive when joking around, say pretending to be a cat or a tiger. Some kids love to make silly faces or have you make silly faces at them. Or, sorry parents, some kids are delighted when I can lightly poke fun at their mom or dad! This past Sunday I had Miss M in my studio. I could tell she was enjoying the dresses and she was very cooperative about trying different poses, but I was struggling to get her to open up and really smile. And then it happened. She had changed into a leotard and tutu and I knew she has a dance recital coming up, so I asked her to show me some of her routine. Instantly her expression changed to one of concentration and she went through her routine. And after that she let loose with dance poses and twirls, all with smiles and a light shining through from within. She clearly felt in her element and I even got some giggles from her. That moment for me was truly uplifting. The energy and excitement that children bring to their passions is some of the strongest and purest that any of us will ever experience in our entire lives. Just being around it and observing it can uplift a grown-up’s spirit. Thinking about working with these different children, and how the key to unlock their excitement and happiness is so unique, made me think of my own children and their passions. My son is only 2 so what really sparks him isn’t quite so clear yet (though sneaking into my car to “drive” is the current favorite, sigh). But my five-year-old daughter has truly shown passion over the last few years, skiing. We put her on skis twice when she was 2. It didn’t go that well. When she was 3 she did a few lessons and got interested. The year she was 4 it was clear that she had a passion. Starting that winter and continuing through this last ski season, she is now an insatiable skier. She will ski through the coldest winds. She will ask to skip lunch to go for a few more runs. She will keep skiing long after she is clearly tired. When she falls, which isn’t often, she laughs and gets up for more. At the end of the day she wants to know when she can go back out again. Needless to say this effortless approach to an activity is not the norm in our lives with a spirited and strong willed kindergartener! Skiing brings out the best of the best of her skills, behavior and character. My husband and I are really in awe of her love for skiing and how much she will easily overcome to get as much time on the slopes as possible. Luckily we live in the Northeast, close to ski areas, and both like to ski so it’s a fun thing for us to encourage in her. But even if we didn’t, I know we would do whatever we could to make skiing happen for her. Because when you see you child so lit up about something it is electrifying. It feels like peeking into their souls and seeing there not the baby you held sweetly in your arms but all the boundless potential that this whole person contains for the span of their lifetime. And if you as their parent have the ability to foster that, then really you must. I was speaking with a friend the other day who has been a ski buddy of ours the last few years. We may not see them on the ski hill that much next year because as much as she and her husband love to ski, her son LOVES hockey. For him that’s what he wants to do when he has a choice, that’s what he would prefer to do over any other activity. And so while his parents might prefer to be skiing most weekends, they will be bringing him to hockey rinks and helping him practice and grow in the sport he loves. Now don’t get me wrong, I’m not saying that kids’ wishes and desires should trump those of the whole family. And I’m certainly not that you spoil them or press them for it, but if sacrifices must be made in other areas to allow that passion to flourish then we do so. Within the right bounds I think it’s important that we weed out some of the unnecessary in our over-scheduled lives to give real time and devotion to what makes our kids, and ourselves, feel alive. If you ask my daughter these days what she wants to be when she grows up she will tell you she wants to be a swim teacher in the summer and compete in the X-Games in the winter. The first part sounds great to me, the second terrifies me. But it’s also thrills me, what an amazing dream. Who knows if she’ll ever even come close, but how amazing to be five and believe with your heart and soul that you WILL do something. No self-doubt, no fear, just confidence and excitement. I’m happy just to sit close to such a small vibrant person, smell the top of her head which still has that warm “kid” smell, and marvel at what life will hold for her. What do you think? I’d love to hear from you. What have you found that sparks your small children? Did it surprise you? Parents of grown children what happened to your kids’ childhood dreams? Any of them come true? Or the opposite? What an expression, love it! Miss M in her element! When a young girl enters my studio I am both excited and also filled with a sense of responsibility. The excitement is contagious, seeing eyes get wider at the sight of sparkling fabric and tentative smiles when encouraged to try on a dress. The sense of responsibility comes with knowing that if I’m able to listen and observe closely enough, I can hopefully figure out what fabrics and details of her dress will bring to light her secret wishes. Making a custom gown for someone is a delicate process. What a child is initially drawn to is not always what is going to fill up their heart with pleasure when they see the finished product. So I like to encourage the girls to explore, take their time looking around, let them touch and feel the fabrics, encourage them to try on what samples I have about. It’s usually pretty clear when they find something that speaks to them, they light up in a way that is authentic and beautiful. The other side of this equation is in my own tastes and feelings. I’ve learned that if I’m not inspired by someone’s choice then it’s very difficult for me to design a gown that ends up looking great. Which is why on these custom projects I’m pretty strict in that the customer can pick usually only one element, be that a certain color, type of fabric, style feature etc. This allows me to have a broader range of creativity while working on the design, while I always keep that girl’s tastes and preferences in mind. My most recent project has been a real delight. When my friend arrived with her girls they were all very excited and the girls were quite busy looking at all that I have here. (It’s quite a little girl heaven with plenty of my princess dresses, old dance costumes, and shiny and sparkly fabric galore!). L, who’s dress I was to make, is a very soulful girl. She can be quiet and reserved but is a keen observer who says much more with her eyes than she sometimes speaks aloud. She was very reverent and careful in trying on dresses and handling the fabrics, but big warm smiles told me she was excited. And after carefully considering all the options, Miss L really surprised me. Bypassing all the glitzier glittered and sequined fabrics available, she selected a delicate pink and white striped silk chiffon. It was a fabric I had bought a few years ago for women’s clothing and hadn’t considered it for my princess gowns. But as she held it up I could see how lovely it would be. I was pretty inspired so I pulled out some boxes of trim and L and I pawed through them together. She was drawn to a gold and white braid trim and I immediately loved the sophisticated mix of colors she had selected. We also spent some time talking about how the dresses are made and how I keep track of projects. L had keen questions and I think was really absorbing it all. I love it when children surprise me, as they always do. How wonderful that an almost six year old girl would be so interested in how things work and not just dazzled by pretty dresses. I was pumped for a couple days on how exciting it was to have L and her sister in my studio. I work alone for the most part, which I enjoy, but having this usually solitary space infused with their enthusiasm, wit and joy really elevated my mental state. And it really helped reinforce for me that what I’m doing is not just about creating pretty things, but allowing both myself and my customers a chance to delve into our imaginations, identify things in life that spark an inner delight and also to feel the deep satisfaction in making and owning something that comes from someone’s own two hands. I think even small children feel differently when they put on something that was made by hand and made lovingly. I’ve seen them pull themselves up a bit taller, their movements a bit more precise. There is a tangible magic in knowing you are in possession of something that took time and effort to make. And I think giving children the honor of owning things that are valuable and trusting them to care for them is important. Life is not a throw away exercise and providing opportunities for little ones to see that they are trusted to have special things teaches good lessons. And the fact that the gowns are not made to resemble a specific character, but rather are made from things that inspire the girls themselves, it opens up channels of imagination and exploration for them as they play. It allows them explore their individuality and celebrate those parts of themselves that they find beautiful. There is no one recipe for being lovely and feeling good about one’s self, that’s why each garment I work on is different from the next. It’s a wonderful way to be able to celebrate girlhood, each girl in her own unique way. The dress is almost finished now and I can’t wait for her to see it!